Credit: By stshank on Flickr. Some rights reserved. A platform which data journalists can use to find, upload and visualise data is launching a new Chrome extension to bring access to its library of data to the user as they browse content online. Knoema, which launched in public beta two years ago, features an extensive library of data relating to countries from across the world, covering subjects such as healthcare, education, inflation and the stock market. Vladamir Bougay, chief technical officer at Knoema, said the platform aims to cover the complete data journalism process, acting not just as a data source, but can also be used to create a range of embeddable visualisations, from simple line and bar charts, through to advanced maps. There are a series of tutorials on YouTube, covering techniques such as how to format a spreadsheet so users can upload their own data, as well as how to build visualisations on the platform. Now the site is launching a Chrome extension which will link together content from across the web with relevant data and visualisations already existing on Knoema. 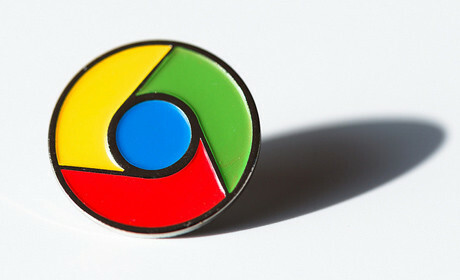 Due to be officially launched to the wider public next week, but already available on the Chrome Web Store, the World Data Finder Chrome extension is able to spot certain keywords or data within an online article, and then surface other relevant data and visualisations held on Knoema to share with the user. The extension icon appears at the side of a user's URL bar and once clicked on, if there is relevant data on the Knoema platform, it will then open a small window containing links to similar data and visualisations, which could offer the user greater context to the information on the page. 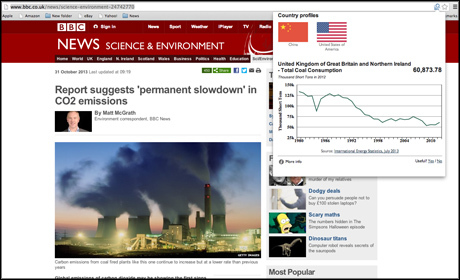 The screenshot below illustrates how the extension works, in this case used in relation to a BBC News story. For data journalists, Bougay said this could prove a useful tool in research stages, to help discover data sets already available around a specific topic. "What we are trying to do with this extension is really streamline the work of anyone who is doing some research based on a specific article or set of articles and looking for relevant data and visualisations," he told Journalism.co.uk. "For example, if you are reading an article on US economics, there are a lot of things like GDP, inflation, and unemployment mentioned. You click on a button and you get a US GDP chart, US unemployment chart, US inflation chart directly right there. So you can see real numbers and you can further explore." For journalists, the main Knoema platform could also be a useful resource for their work. And not just data journalists. "We believe that Knoema is a very good resource for just plain fact-checking," Bougay said. "We have a lot of data in the system and the main indicators you can find represented by multiple sources. "So if you are writing an article on health care, you can find relevant data and just reference these data sets in your article." As well as using the library of data already available on Knoema – which is added to by a "dedicated data team" – users can upload their own datasets to use, or even combine with others. "This is more complicated," Bougay added. The platform is built to help automate certain processes for the users, Bougay said, with "useful tricks built in". For example, if your data set contains country names, the system will flag up to the user other references to that country in other data already available on the platform, "without any effort on your side". "You can use this knowledge to make your life easier," Bougay said. The platform aims to be "an end-to-end tool for all your data needs", he added, "starting from finding data for your research, for your analysis, for your story." "Then we provide tools for data visualisation and data analysis and finally we also help people share the stories, visualisations and connect them to each other on various data-driven issues or tasks." When creating visualisations "it's not like starting from scratch", Bougay said, with examples made public by others which users can to learn from. "We have a gallery of visualisations by other people. One of the best ways to start doing something with Knoema is just to get this visualisation, then save a copy and then start modifying this copy. "It's very easy and it lets you do something useful without really understanding the entire flow." He added that users can keep visualisations private, or they can publish it and state their copyright so others do not re-use it. However he said the "majority of data sets at Knoema are really public data sets". "The basic assumption at Knoema is if you make your visualisation public then you're okay with other people using it, exporting it or making a copy. "If you're not happy with other people making any interpretation then you either explicitly claim it or just don't put your visualisation into public domain." The platform is free to use, with charges only applying to companies who ask for a "customised, branded or private data portal". As well as launching a Chrome plugin, Knoema has also moved further "into the data collaboration space", Bougay said, with its new 'data market', which he described as "a traditional marketplace for data-driven jobs and data-driven work".